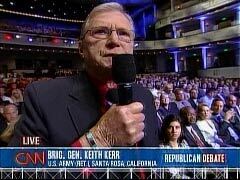 CNN, as part of its Republican debate with YouTube, failed to mention that retired general Keith Kerr, who announced he was gay after his retirement from the Army, is a member of Hillary Clinton’s "LGBT Americans For Hillary Steering Committee." Not only did General Kerr ask the question via a YouTube video, but he was also present in the audience, and got to ask the candidates for a "straight answer" (pardon the pun). General Kerr’s, whose question came 47 minutes into the 9 pm Eastern hour the debate, is also part of the Servicemembers’ Legal Defense Network's advisory council, an organization "dedicated to ending discrimination against and harassment of military personnel affected by 'Don't Ask, Don't Tell' and related forms of intolerance"
Host Anderson Cooper first directed Kerr’s question to California Congressman Duncan Hunter, followed by responses from Mike Huckabee and Mitt Romney. Cooper then asked Kerr if he was satisfied by those who had answered his question, and was given a minute to address the candidates. Senator McCain then replied to Kerr’s question. BRIG. GEN. KEITH KERR, U.S. ARMY (RET. ): My name is Keith Kerr, Santa Rosa, California. I'm a retired brigadier general with 43 years of service, and I'm a graduate of the Special Forces Officer Corps, the Command and General Staff Course, and the Army War College. And I'm an openly gay man. I want to know why you think that American men and women in uniform are not professional enough to serve with gays and lesbians? ANDERSON COOPER: I want to point out the Brigadier General Keith Kerr is here with us tonight. I'm glad you're here. I give the question to Congressman Hunter. CONGRESSMAN DUNCAN HUNTER: Yeah. General, thanks for your service. But I believe in what Colin Powell said, when he said that having openly-homosexual people serving in the ranks would be bad for unit cohesion. And the reason for that, even though people point to the Israelis, and point to the Brits, and point to other people having homosexuals serve, is that most Americans -- most kids who leave that breakfast table and go out and serve in the military and make that corporate decision with their family -- most of them are conservatives, and they have conservative values, and they have Judeo-Christian values. And to force those people to work in a small, tight unit with somebody who is openly-homosexual, who goes against what they believe to be their principles -- and it is their principles -- is I think a disservice to them. And I agree with Colin Powell, that it would be bad for unit cohesion. COOPER: I want to direct this to Governor Huckabee. 30 seconds. GOVERNOR MIKE HUCKABEE: The Uniform Code of Military Justice is probably the best rule, and it has to do with conduct. People have a right to have whatever feelings, whatever attitudes they wish. But when their conduct could put at risk the morale, or put at risk even the cohesion that Duncan Hunter spoke of -- I think that's what is at issue, and that's why our policy is what it is. COOPER: Governor Romney, you said in 1994 that you looked forward to the day when gays and lesbians could serve, and I quote, 'openly and honestly' in our nation's military. Do you stand by that? ROMNEY: I can listen to the people who run the military to see what the circumstances are like. And my view is that at this stage, this is not the time for us to make that kind of a decision. ROMNEY: I didn't think it would work. I didn't 'don't ask, don't tell' would work. That was my -- I didn't think it work. I thought that was a policy -- when I heard about it, I laughed. I said that doesn't make any sense to me. And you know what? It's been there now, for what, 15 years? It seems to have worked. COOPER: So, just so I am clear, at this point, do you still look forward to a day when gays can serve openly in the military or no longer? ROMNEY: I look forward to hearing from the military exactly what they believe is the right way to have the right kind of cohesion and support in our troops, and I'll listen to what they have to say. COOPER: General Kerr, as I said, is here. Please stand up, General. Thank you very much for being with us. Do you feel you got an answer to your question? KERR: ...and we're talking about doctors, nurses, pilots, and the surgeon who sews somebody up when they are taken from the battlefield. COOPER: I appreciate your comment. Senator McCain, I want to give you 30 seconds. You served in the military. MCCAIN: General, I thank you for your service to our nation. I respect it. All the time, I talk to our military leaders, beginning with our Joint Chiefs of Staff, and the leaders in the field, such as General Petraeus and General Odierno, and others who are designated leaders with the responsibility of the safety of the men and women under their command and their security, and protect them as best as they can. Almost unanimously, they tell me that this present policy is working, that we have the best military in history. We have the bravest, most professional, best prepared, and that this policy ought to continued, because it's working. [Update, 11:23 pm Eastern: During the post-debate coverage on CNN, Bill Bennett mentioned that he was receiving 'a ton of e-mails' about Kerr being on Hillary Clinton's 'gay steering committee." BILL BENNETT: "On that 'don't ask, don't tell' [question], I'm getting a ton of e-mails saying that this guy who asked the question was part of Hillary Clinton's gay steering committee. I don't know if that's true or not, but if he is, that certainly should have been disclosed...."
BENNETT: I don't know. I'm just getting the e-mails to that effect. [Update, 11:40 pm Eastern: At the close of the 10 pm Eastern hour of post-debate coverage, host Anderson Cooper confirmed the tips Bennett received.